The leading telecommunications services provider, will be involving in a strategic partnership with Coverage Broadband, a subsidiary of Phase 3 Telecom, to launch 3flix mobile TV service in Nigeria. The partnership promises to offer customers who subscribe to a special bundled data plan on Airtel a unfettered access to 3flix live television channels that covers music, movies, sports, fashion, entertainment, news, documentary, cartoon, comedy and lifestyle, amongst many others. The 3flix TV app is however not a cable TV, as it is rather designed for smart phones, providing premium television content to Nigerians across the country. Airtel customers will be able to access the feature after dialing *2424# to activate the 3flix mobile TV service or log on to 3flix.tv to access the service on the web. 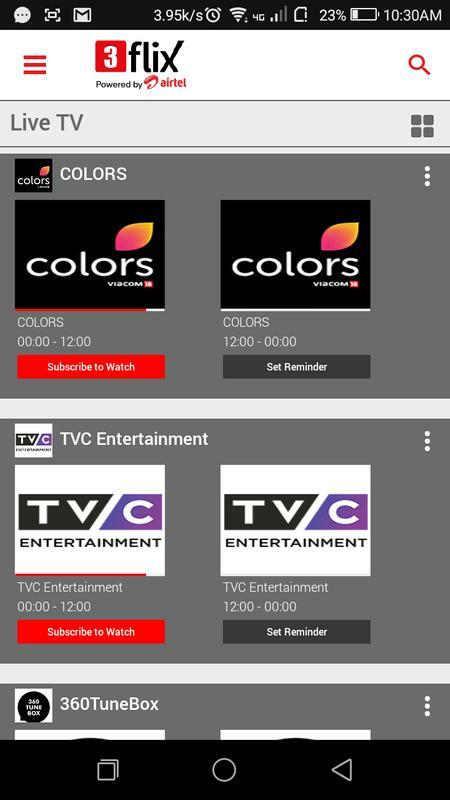 The 3flix service has a TV app that is only available on Google PlayStorefor AOS users at the moment, promising to extend services to the iOS users In the nearest future.The tariff for the service is pegged at N20 for daily subscription and N75 for Weekly subscription. Dinesh Balsingh, acting chief commercial officer, Airtel Nigeria, informed that the telco will be committed to creating and supporting innovative value that offers excitement, delight and in the same vain empower more telecoms consumers across the country. “Airtel is positioned as the mobile Internet service provider of first choice for Nigerians and currently, we have the largest 4G network in the country. We are excited with the partnership with 3flix as we will enable more telecoms consumers to enjoy all the fun mobile TV provides; keep abreast with latest news; follow-up with celebrities and watch their favorite sports team on the go, regardless of location,” he said while commenting on the lunch of the mobile TV service. Mr. Stanley Jegede, chief executive officer of Phase3 Telecom who also commented during the event, informed that, Phase3’s foresight to focus on the opportunities in emerging markets led to the creation of Coverage Broadband, and the subsequent partnership with Airtel Nigeria, to offer subscribers a distinctive mobile TV viewing service, that offers a very low range of data subscription. “While 3flix mobile TV would continue to expand its library of great content, we are particularly excited that the product is designed to adapt in features, technology, and aggregation just as the viewing and immersive experience of consumers continue to evolve,” Mr. Stanley Jegede said. Vikram Bhatnagar, executive director of Coverage Broadband commented on the readiness of the team to deliver a grat service to the general: “The entire team is armed with the required expertise to see 3flix take the lead in the world of bringing affordable, ingenious, and quality digital content which subscribers can watch everywhere on their preferred mobile device.” Coverage Broadband is a subsidiary of Phase3 Telecom, and has been issued a mobile TV/OTT broadcast license from National Broadcasting Commission (NBC), and a VAS license from Nigerian Communications Commission (NCC). Hence, the creation of its flagship product – 3flix to offer made-for-mobile TV channels, which was built in collaboration with foremost technology, and media partners in the country. In conclusion, the mobile TV brand promises to vend quality product as well as exciting contents that is affordable, and runs on ease-of-use features for subscribers to stream live TV on the go with an uninterrupted network powered by Airtel Nigeria.